With its focus on crew welfare, MLC 2006 will affect many charter yachts and new builds. Regulations and operating costs differ widely depending on whether a yacht is offered for charter or not. If an owner decides to offer their yacht for charter, whether the vessel actually completes any charters or not, the regulations and associated costs of being available for charter remain constant. First, the vessel must be certified by one of the seven major classification societies and inspected annually by the appropriate society. If the vessel was not built to class, the owner could face a costly, lengthy process to bring it into compliance. Assuming the vessel is in class, operating budgets must allow for annual class inspections/surveys, annual flag inspections/surveys, ISM/ISPS audits, and the cost of hiring a management company to administer some of the regulations. Insurance premiums may be slightly cheaper for a vessel in class, but not significantly. Second, charter yachts must meet requirements for a Minimum Safe Manning Document (MSMD), meaning only seafarers who hold the appropriate qualifications under STCW95 will be permitted to crew the yacht. This will likely mean a higher payroll. 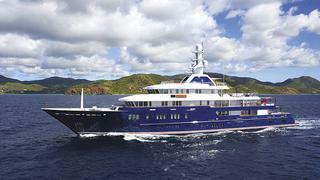 The decision to operate a yacht for charter will also impact the choice of the yachts flag of registration. Some flag administrations have historically offered greater benefits or choices regarding charter operation for tax, employment, wages or even pollution control, but they may have a lesser rating as a flag and consequently be inspected or boarded more frequently by foreign port states. The major flags are on the so-called White List, which means that they have a good record with few deficiencies at inspections. Some of the lesser flags are notorious for badly run ships so they are classified on the Grey List or the Black List. These designations arose from meetings in Europe in 1982 about the necessity of port states to be able to enforce a code of safety standards. This came about following the sinking of the Amoco Cadiz in 1978 which revealed obvious inspection flaws of some flags of convenience. The resulting Paris Memorandum of Understanding (MoU), in use by 26 European countries and Canada; the Tokyo MoU (Asia Pacific); the Caribbean MoU; and the US Coast Guard rate flag states on issues of safety, pollution incidents, and whether or not the flag states have ratified various international treaties such as SOLAS, the Load Line Treaty, and ILO 147, which sets minimum worker protection standards. Bolivia and Sri Lanka, for example, have not ratified SOLAS, MARPOL, Load Line 66 or ILO 147. The end result is that a yacht flying these flags would not have to comply with those rules, and would be subject to fines if a port state the yacht was visiting chose to pursue the issue.